Knee Defender fight: United Airlines Flight 1462 diverted over legroom kerfuffle. A Fight Over Legroom Forced a Plane to Divert. Airlines Should Have Seen This Coming. On Sunday, United Airlines Flight 1462 from Newark to Denver was forced to divert to Chicago. When the plane landed at O’Hare International Airport, city police and TSA officers escorted from the aircraft two passengers who had caused an in-flight kerfuffle. The cause of their fight? Legroom. The fight started when the male passenger, seated in a middle seat of row 12, used the Knee Defender to stop the woman in front of him from reclining while he was on his laptop, according to a law enforcement official with knowledge of the situation who spoke on condition of anonymity because they are not authorized to speak. A flight attendant asked him to remove the device and he refused. The woman then stood up, turned around and threw a cup of water at him, the official says. That’s when United decided to land in Chicago. The two passengers were not allowed to continue to Denver. The Knee Defender, as it turns out, is not strictly prohibited by the Federal Aviation Administration but is banned by most major U.S. airlines, including United. * Still, you can’t really blame the passenger for trying, especially since airlines seem in the business of cramming ever-more passengers into ever-smaller seats. Seats that spanned 18.5 inches throughout the 1990s and early 2000s today have dwindled to just 16.5 inches in width. The space between rows has dropped by about 10 percent, from 34 inches to just 32 or 30 or even a measly 28 inches. At the same time, the typical passenger has grown taller and packed on extra pounds. Reclining seats, of course, compound the shrinking-seat problem by allowing the most egregious recliners to steal the last few inches of legroom from the reclined-upon. The Knee Defender is one attempt to pre-empt this. You can also politely ask the recliner to retract his chair, but that often doesn’t go over well. 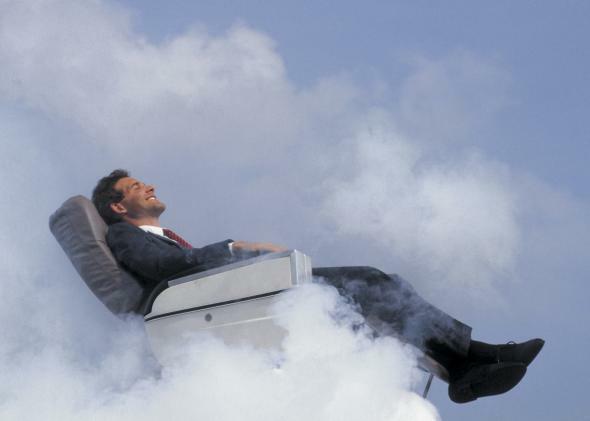 Slate’s Dan Kois has suggested a more comprehensive fix: ban airplanes from installing reclining seats at all. The cheap and much-hated Spirit Airlines does this—packing more passengers onto its flights than carriers like JetBlue and United but keeping its seats rigidly upright. Boeing is toying with seats that recline less. Taking away legroom and squishing people into planes like sardines makes great economic sense for airlines, but sooner or later someone was bound to crack. That happened on Sunday with United Airlines Flight 1462. The irony in this case was that the quibbling passengers were seated in the Economy Plus section—where there was already an extra four inches of space. *Correction, Aug. 26, 2014: This post originally misidentified the Federal Aviation Administration as the Federal Aviation Authority.